01 Firstly make the stuffing. Melt the butter in a large frying pan over a low heat. Add the onions and sage and gently cook for 10 minutes, until softened. Next, increase the heat to high, pour in the Calvados and cook for 1 minute. Let the mixture cool, and then stir in all the remaining stuffing ingredients. 02 Stuff the pork joint with the stuffing. Roll the joint and tie. Score the fat with a sharp knife, pour over boiling water and rub salt and oil into the fat. 01 Pre-heat the barbecue for roasting (in-direct method) at a medium heat. 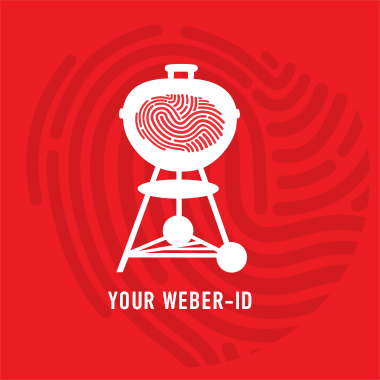 02 Place a Weber Drip Tray in the base of the barbecue and pour in the cider and Calvados. Roast the loin for around 2 hours using the Premium Grill Rack or a Roasting Rack with Roasting Shield. Until cooked through to 75°C and allow to rest. 03 Using the reduced cider and Calvados, add in the double cream, wholegrain mustard and splash of stock, if required. 04 For the apple sauce, peel and roughly chop the apple and place in a foil parcel. Add the butter, honey and thyme. Season well. Barbecue for 45 minutes until you have pureed apples. 05 Slice the pork and serve with the apple sauce and Calvados cream.